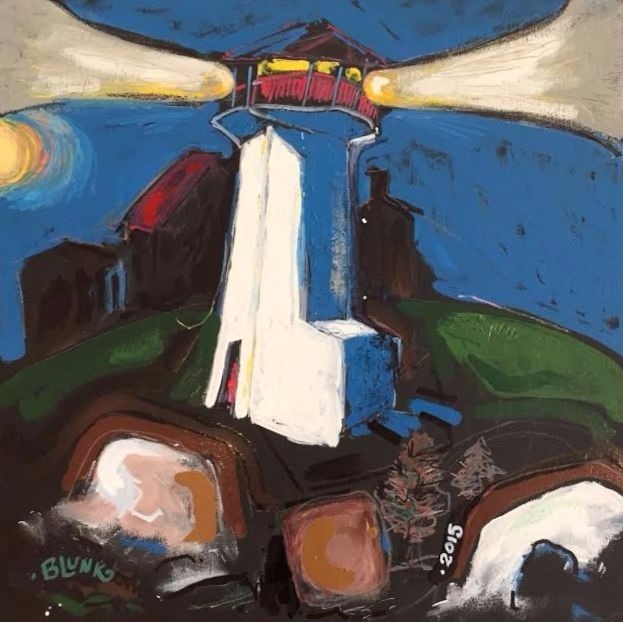 Robert Blunk is a distinguished artist of note in the Midwest. His work has been collected by museums (e.g., Spencer Museum of Art, Lawrence, Kansas; Hale Library, Manhattan, Kansas; Schingoethe Center, Aurora, IL; and the Beach Museum of Art at Kansas State University, Manhattan, Kansas) public arts projects on behalf of municipalities as well as by private collectors. His family is justifiably proud of his legacy. In this exhibit they share the vision, breadth and the prolific nature of his work with a broader audience. Robert Blunk was born in 1923 in Salyards, Kansas. After serving in the Pacific with the Marine Corps in World War II, he returned home to Kansas and earned a Bachelor of Fine Arts at Kansas City Institute of the Arts in 1950. For over 40 years, he had a notable teaching career combined with an active career of creating public sculptures, designs and installations. In addition to this impressive public profile, Blunk painted and made sculpture in his studio. As with any artist, his style evolved over the years. There are themes that resurface throughout his work – both in the paintings and the sculpture. A consistent exploration of space and color is evidenced in both his two-dimensional and three-dimensional work. Blunk is drawn to seascapes and landscapes and permutations of the two, figurative and abstract. There is an element of the spiritual that permeates some pieces. As an example, in one instance, a trip to Puerto Rico resulted in an assemblage with a heraldic angel. His interests - as far ranging as Egyptian art to the Wright Brothers - earn witty or overt reference in some pieces. Blunk admires the works of artists ranging from Alexander Calder to David Smith and George Nakashima, and including Paul Klee, Van Gogh and outsider artists. 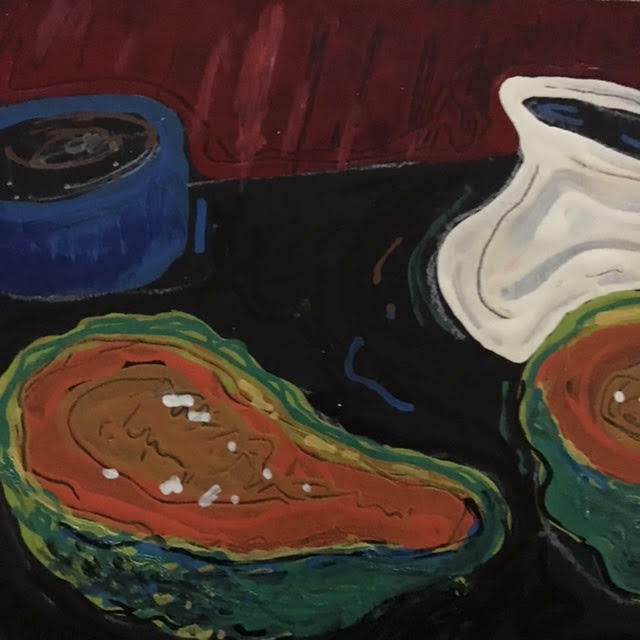 in his most recent body of work, he draws inspiration from Matisse, Marsden Hartley and Van Gogh. "I like working with simple elements. A red apple is really an excuse to use a patch of red. The red on a blue table is like two notes on a piano; adding a third color and shape is like a musical chord. A white pitcher sets off thoughts of grandma and kitchens and milk. I like exploring. I don't use an easel because I like to use heavy coats of wet enamels and then "drawing" in the wet paint as it dries. The kitchen table is often my easel. I try to paint about 3 1/2 hours a day. " Robert Blunk’s talents, tastes and interests are broad, but his vision is singularly his own. Blunk continues to paint largely at his studio in Denver, Colorado, having relocated there within the last seven years. However, he is currently painting in New York where he and his wife, Diane Kelley, have rented a flat.